Return of The Haunted House! 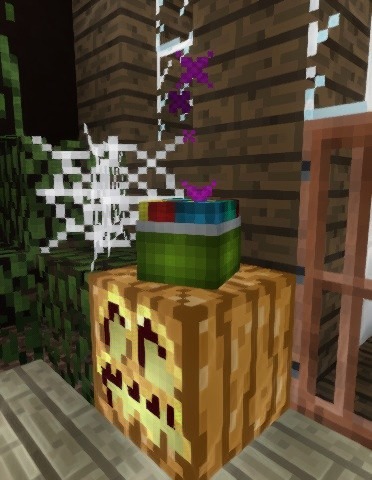 The Great Pumpkin at /spawn will whisk you away to a land of night terrors, where bizarre creatures prowl the grounds, and a dark mansion lures you inside with the promise of danger and reward (also use /halloween). Visit the library where the books wander off their shelves to attack unsuspecting victims, or the ghostly ballroom where the apparitions quickly lose their tempers if you get too close. And be careful in the kitchens -- the undead cooks tend to throw their sherry bottles. Things start to get strange on the second floor -- something seems to have gone very wrong here. Explore the many rooms and battle the creatures that remain to avenge the fallen and loot the rare treasure. The more adventurous will discover hidden rooms — has anyone else noticed that this house seems to grow new rooms every year?! And stumble through the secret entrance to The Labyrinth of the Damned, where those who persevere will be greatly rewarded. Proceed to the upper floors if you dare -- thick with danger and mystery, only the most courageous will make it to the theater in the apex of the mansion, where sinister creatures make their nest. Do you dare disturb them? Don't delay... this spooky adventure will only be available for a limited time! New for 2018, carved into the mountains behind the mansion, find the entrance to the Poltergeist’s Lair. Peeves has haunted the mansion for years — now discover his dark roots. Bring your sword, and maybe some extra Depends. And be sure to have sounds on. The Old Village has gotten into the spooky spirit! Come to /warp OldVillage to check out the creepy decor, battle a few undead monsters, and search for the 4 candy baskets hidden around the town for special treats! Costume Contest & Pumpkin Carving! Starting at 12:00am EST the morning of Halloween, Wednesday October 31, join us at /warp pumpkins for pumpkin carving and a costume contest! Dress in your most ghoulish getup and have a scary good time! The festivities will last until 11:59pm, when the contests will be judged. The entire plot can be used. You can bring in any of your own materials to use in your build. Teams are allowed, but winners will split the prize. All builds must be completed by the midnight deadline or they’ll… turn to pumpkins. Since we probably won’t all be on at the same time, all entrants should take a selfie (F5 to change the camera, then F2 to snap!) and post it in the “2018 Halloween Skin Contest” thread on the forum during the submission period.